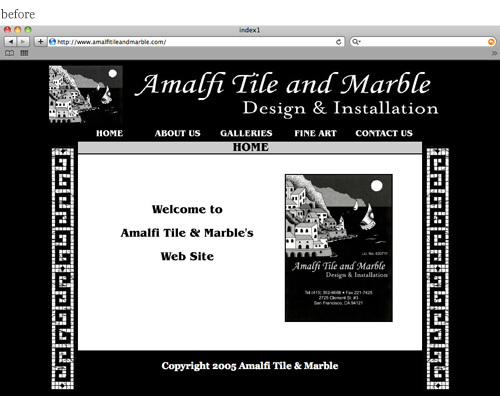 When this San Francisco-based client came to us with an outdated web design, we were eager to help. 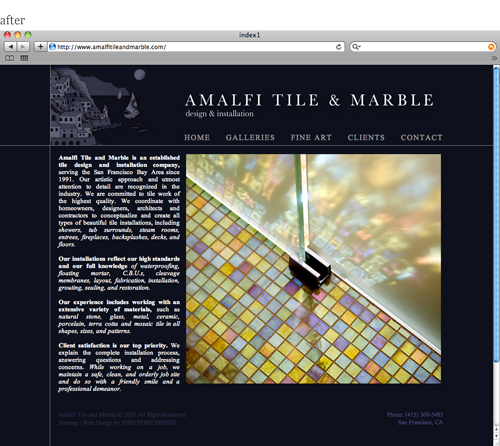 They had an amazing portfolio of images showing their expert tile and marble designs, and served a high-end clientele, but their web design didn’t communicate their expertise, nor was it as effective as it could be in attracting their target market. Because the web design was outdated, it had not been built with modern Search Engine Optimization (SEO) practices. For example, there was very little text on the “Home” page, which is a serious detriment to a website’s search engine ranking. In the new design we incorpoarted all of the content that had previosly been hidden away on the “About” page into the “Home” page. We also made good use of the client’s beautiful images in an enormous showcase slideshow. With more sophisticated fonts, a fresh and elegant layout design, and a diligent commitment to SEO, this client now has a website that effectively communicates their brand and attracts new business.